The Black Irony Coughs Itself Up. 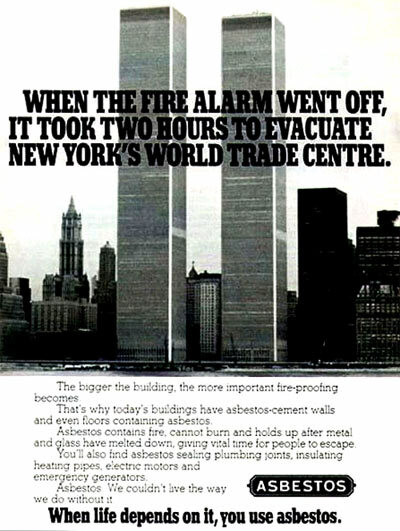 One of Copyranter's readers found this disturbing old-skool ad for asbestos, featuring the former World Trade Center. ...judging by the look and type, I'd say is circa 1970s-mid80s. Copy reads: "Asbestos contains fire, cannot burn and holds up after metal and glass have melted down, giving vital time for people to escape." Also, note the tagline. [When life depends on it, you use asbestos]. The ad is from a Canadian company, Asbestos Corporation Limited. Surprised they're still operating and haven't been sued into a pile of dust. It hits me very hard personally: my Father has asbestosis in his lungs from 37 years of pipe-fitter work for a big DuPont chemical plant. The company's plant physicians kept his condition a secret from him for many, many years. On the other hand, if they hadn't removed the asbestos, the towers may not have collapsed. Some guys like breasts, I like asbestos. It was my understanding that the asbestos had NOT been removed from the building by 2001, and that it was one of the major reasons why the pyrotechnic clouds of dust exploding from the Twin Towers was toxic. What is the definitive word on those two allegations? This asbestos ad is very interesting. I didn't realize that asbestos could do all of those things. Wouldn't this be yet another reason why the towers shouldn't have collapsed as quickly and uniformly as they did - if asbestos was reinforcing the walls and floors of the cement in the WTC towers? Anonymous2 on Fri, 04/06/2007 - 10:13am. Asbestos is a scam. ....at least in steel structures. It is not needed. Structural steel can withstand the temperatures of the hottest fires.....at least long enough to alllow evacuation of the structure. JJJames on Fri, 04/06/2007 - 10:18am. asbestos was banned during the construction of the wtc towers, one full building contained it by that point, and the second mostly did not. Then over the years they were slowly removing it and replacing it with something else. By the time 9/11 rolled around there was more of the towers volumes NOT containing asbestos than that which did. CattleRustler on Fri, 04/06/2007 - 11:04am. Real Truther on Fri, 04/06/2007 - 1:33pm. that on 9/11/01one of the Towers had asbestos on 40% of its floors and the other had 20%. This same article stated that no insurance underwriter could be found for the removal process and that the EPA was not going to give the Port Authority any additional extensions on abating the problem. Then Mr. Silverstein and his partners lease the buildings for 99-years, take out an extremely large anti-terrorism insurance policy, 9/11 comes along and the problem is "solved" with the government paying for the clean-up. The EPA even "helps" by allowing their air quality reports to be edited by the White House so NYC can get back to work and 70,000 + people can get sick. All the perps need to go to prison, the sooner the better. LeftWright on Fri, 04/06/2007 - 3:34pm. Someone needs to sue the people who either "installed" the asbestos , and/or the people who provided it, because apparently they didn't do it right. According to the Official Government Conspiracy Theory Story, the fire protection was knocked off the beams, which obviously means it wasn't applied correctly or sufficiently. So a class action lawsuit against these people will bring out the truth. Let them defend themselves in court and show that the OGCTS is (more) incorrect. That would be another win for 9/11 Truth. I wonder about the people who "took the money" payoffs for their relatives who were killed in the Twin Towers — did they sign a piece of paper saying they would not sue ANYONE, EVER? I don't think that is legally binding. I think they would have to specifically specify each person, agency and corporation who they would not sue. And, if they did do that, they had to miss a few. "When the game is over, the king and the pawn go into the same box." doughnut on Fri, 04/06/2007 - 4:35pm.